Over the past 5 years, the scale of mobile commerce in its various forms has grown at a remarkable rate. As more mobile computing devices -- such as smartphones and media tablets -- became available for browsing online content, the mobile commerce marketplace thrived. 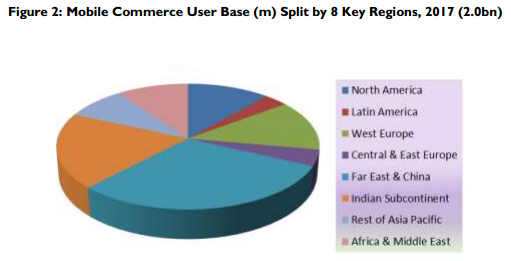 In 2001, global business-to-consumer eCommerce sales were around $63 billion anually. By 2011, sales had increased nearly 12 times to $745 billion. In 2012, these sales increased by a further 28 percent to reach $952 billion, before increasing by a further 23 percent in 2013 to approach $1.2 trillion. According to the latest worldwide market study by Juniper Research, just over 2 billion mobile phone or tablet users will make some form of mobile commerce transaction by the end of 2017 -- that's up from 1.6 billion in 2014. Juniper believes that mobile consumption of services such as banking, money transfer and purchases of goods and services was surging as consumers were either migrating from desktop usage or becoming first-time eCommerce users through their smartphones or tablets. They discovered that in a number of developed markets around the world, mobile devices would account for over half of online transactions within five years. Juniper also observed that while contact-less payments had yet to gain traction outside Japan and South Korea, Apple Pay was expected to provide NFC with renewed momentum. They say the mobile channel will offer consumers in emerging markets first-time financial service access through the provision of mobile wallets, also by enabling services beyond payments -- such as savings and micro-insurance. "Brands and retailers should certainly seek to integrate their offerings with players such as Facebook and FourSquare. Integration offers reach, allied to the potential to target specific user demographics," said Dr. Windsor Holden, head of consultancy and forecasting at Juniper Research. In order for telecom companies to participate in the new growth, Juniper has recommended the integration of mobile network operator billing capabilities with websites to monetize digital content among a wider mobile device user base. Consumers concerns around transaction security remain the primary inhibitor on service adoption. While growth in the number of mobile digital content purchasers in developing markets is relatively low, the value of customers is increasing markedly as they transition from ringtone purchase to rich media content typically monetized through in-app purchase.